This crème is excellent for those who like to golf, play tennis and surf. Adriana s face lifting crème is fabulous! After the first week I saw a noticeable difference in the texture and elasticity of my skin. My skin felt tight and incredibly soft. Wrinkles and pores are literally diminished. Adriana is an expert in her field. I have been using her products for six months and my skin looks extremely smooth and beautiful. I have never seen results in any product as extreme as Adriana s, and I have used all of the top of the line cosmetic products out there. After using the face lift crème for just two days I saw dramatic results. My skin looked much younger and smoother. I am thrilled with the crème and encourage anyone who wants to look younger and healthier to try it immediately. It works! I see improvement in my skin from just one weeks use. It is great! I first went to Adriana for a special facial and was treated very professionally. My face felt great afterwards. I ve been using the products that Adriana makes and my skin has never been this good. Thank you Adriana. treatments and it's worth it! 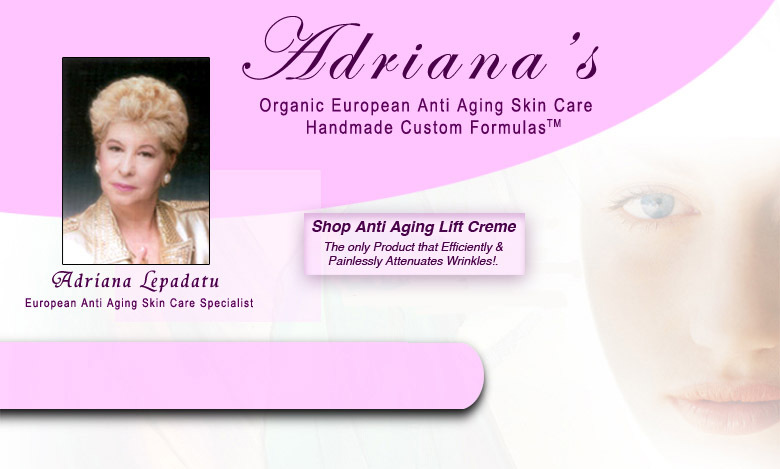 Adriana's products has made an enormous difference. I saw results quickly. Adriana is a miracle. Her products make all the difference. Thank you Adriana for the special facial treatment. It has been the greatest thing that ever happened. My skin is now firm, smooth." Adriana's Anti-Aging Lift Crème is the only skin care product that specifically blends ingredients formulated for youthful skin. The proprietary process combines vitalized oxygen in synergy with Sea Kelp and Hyaluronic Acid. Adriana's Crème soothes, revitalizes, balances, and brings back natural health and beauty to your skin for radiant well-being. RESTORE Natural Oxygen "Vitamin O", containing oxygen molecules, delivers pure and natural oxygen to the skin cells and tissues, enhancing and stimulating new cell growth, which leads to faster tissue repair and faster recovery time. Oxygen also reduces wrinkles and degeneration of the skin. LIFTS Sea Kelp Found in the colder coastal water of North America. It is high in silicon, which benefit to sagging and wrinkling skin. Sea kelp has natural antimicrobial properties, allowing the crème to maintain a long shelf life, with only the smallest amounts of preservatives needed. HYDRATES Hyaluronic Acid Has the ability to attract moisture from the air and bind it to the skin s tissue for a long period of time. This extreme moisturizer is unmatched in hydrating properties, resulting in increased smoothness, softening and decreased wrinkles. Hyaluronic Acid may also help vision, joints and arthritis when penetrating the body. INGREDIENTS: Water, Sunflower, Shea Butter, Glyceryl Glucoside, Glycerin, Cocoa Butter, Tocopheryl Acetate (vitamin E), Hyaluronic Acid, Alpha Lupelin, Vitamin "O", Sea Kelp, Dimethicone, Methylparaben, Propylparaben.